I’ve written about Audaxing before here mentioning how relaxed and economical they are compared to Sportives. In an effort to keep me riding good distances throughout the winter I’ve signed up to be a fully paid up member of Audax UK so I can take part in the many rides available. This was my second ever Audax, with the first one being a short leisurely 100km in the sun in July 2013, as well as my first proper attempt at a 200km ride. I did a 195km ride riding to and from a sportive earlier in the summer and went over 200km technically on one Dunwich Dynamo but they’re not quite the same. The planned route was to go from Whitchurch in Shropshire almost 100km directly West to Dolgellau in Wales….and then back again. Knowing my train was going to be a tiny bit late getting in after the published start time, it was agreed I could set off from the station. Audaxes work partly from honesty and partly from evidence – I had to visit a cash machine and take a receipt as confirmation that I had started from a set point as well as a time stamp. 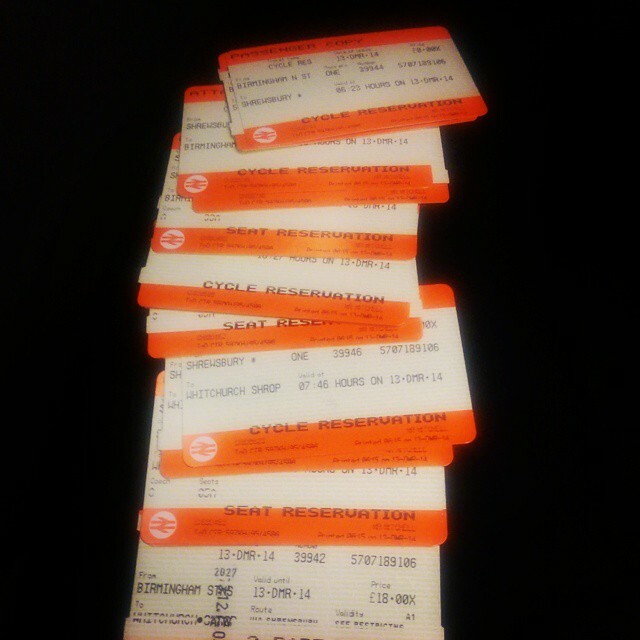 So many train tickets for one return journey! The whole of Whitchurch was covered in sheet ice and I managed to fall off less than 1km into a 200km ride. It was going across a crossroads and I only turned slightly but it was enough on slick tyres to throw me off. Keeping my arms in (like a pro) I fell onto my shoulder which thought about popping out but then didn’t. With only pride properly damaged, I picked up the bike and carried on. Not the best start to any Brevet! Covering new ground across Shropshire there was nothing too distinctive, just countryside and the odd 10% hill. Dropping down through Cefn Mawr and into Llangollen, the scenery changed as we were now in the A5 valleys, which despite being on the main road were still picturesque. A quick toilet stop and a necessary stop to re-attach my saddlebag and I decided to up the pace and go quickly for the next 20 miles which resulted in me overtaking about 8-10 fellow audaxers and riding through Bala and into Dolgellau on my own. View from the first comfort break, could do a lot worse! The Bala valley looks amazing and very similar to the Lakes, I realised I’d underestimated the size of Lake Bala as it seemed to go on for miles and miles. Climbing up out of Bala itself and up to the highest point of the ride, I was now in a pass with no houses and the odd loose sheep looking for a way off the road and back into the fields. It was surprisingly well tarmac-ed and I could look around and enjoy the distant snow-covered mountains further North. It was a very enjoyable winter Brevet so far! There was a steady 15km descent into Dolgellau and a well-earnt food stop and information control. I ordered myself a jacket potato (with chips) and a coffee and remembered to pocket my receipt (proving I’d reached Dolgellau at a certain time) and sat down with 3 Audaxers who it turns out had been ahead of me. Everyone else came in as I was eating, which shows I was never too far ahead of people despite it feeling that way. Time to head back to the start of the Brevet. I left the stop with one of them and we rode back up the gradient we’d just come down – he was riding a fixed gear which is something I couldn’t picture myself doing over such a distance. We caught up the other two who had left before us and reached the top together, then the advantages of not riding a fixed gear kicked in as I was able to go much quicker and go out of sight on the descent back into Bala. 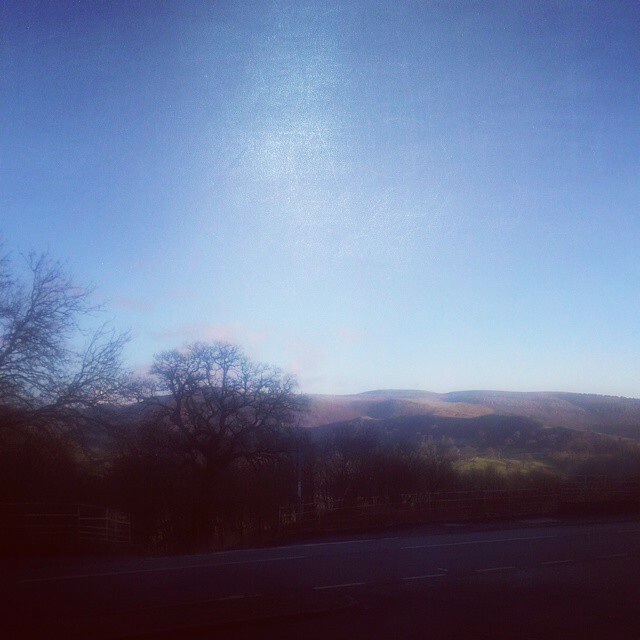 This was the last time I rode with someone as I headed back up to the A5 and back into Llangollen alone. The other side of Cefn Mawr I had a quick comfort break, took a photo of the sunset which was very impressive and saw what was distinctively a bike light coming towards me. The competition instinct kicked in and I set off with a blast to make sure I didn’t get caught and passed and ended up looking over my shoulder a lot for the last 40km of the Brevet. 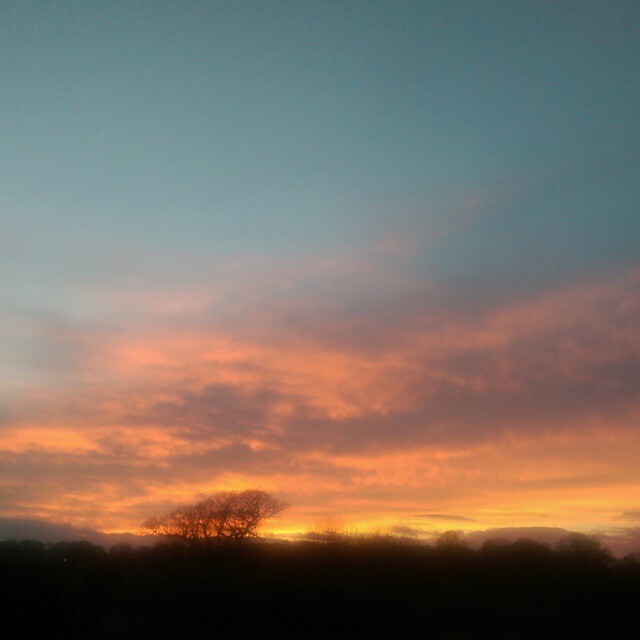 It was getting darker and darker and finally I had to give in, took the sunglasses off and put the lights on. My goal had been to ride as much as possible in the light in order to avoid having to ride too much in the dark, in the end I got away with just an hour or so riding with the lights. The finish involved navigating the dual carriageway Whitchurch by-pass which wasn’t as interesting to see and then reporting to a waiting man in a car. I showed my evidence and it was noted what time I turned up at the finish, apparently I was the second person back, an hour behind the first person (who I suspect had no lunch). Brevet complete! It looks like about 20 of us did the ride, a solid sized group dotted throughout the mid-Wales countryside that day.